I was asked by FujiFilm to run their Instagram account last week, sharing some favourite photographs taken with my FujiFilm cameras. Regular readers will be more familiar with the stories behind my photographs rather than discussions about my setup, so I took this opportunity to present a combination of both. I’ve expanded upon some of those stories here in the spirit of Photographer's Note, but the selection remains the same as those shared with @fujfilmnordic. This photograph was taken at last year’s total solar eclipse in Oregon. It was an awe-inspiring occasion and I was looking for something that linked the audience to the event. I spotted a slice of light falling across the Salem State Capitol Building that served as an ideal metaphor. The image captures something of the sensation many of us experienced; a spectacular and otherworldly sight, and a strange sense of connection between man and the wider universe. You can read more about this event in a previous piece: Total Solar Eclipse. Shot with the FujiFilm X-T2 and XF56 F1.2. My creative background is in the London design and advertising industry, where I also work as a design and art director. The graphic motifs in my photography are no doubt a direct result of my experience; I’m often drawn to silhouettes, shadows, and and striking architectural spaces. I took this photograph in an art gallery in San Francisco, where the vast windows became a canvas upon which to capture passing visitors. Photographed with the FujiFilm X-T2 and XF56 F1.2. This scene was spotted on the streets of Chicago, bathed in glorious hard light. Light is often the first thing to catch my eye on the streets. After that it’s a matter of waiting for the right moment to play out or the most interesting subject to appear. 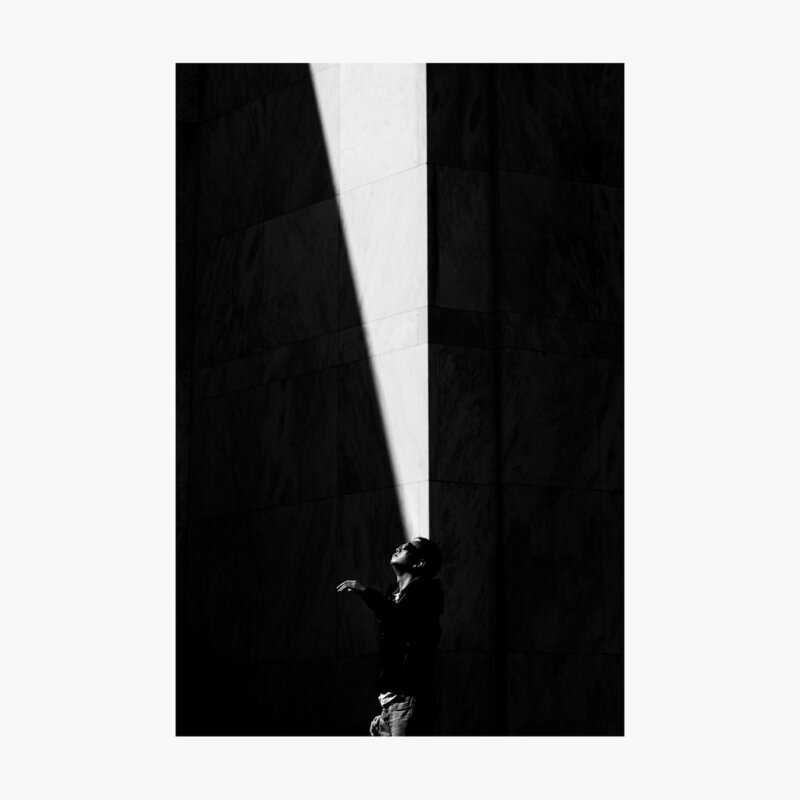 I love the way the slice of light accentuates the looming architecture above the figure. But the image wouldn’t work without the charging child (and her empty buggy) rushing from the darkness. The sign is a key detail in a city famous for its deep-dish pizza. Shot with the FujiFilm X100F (23MM). The day I caught this photograph was also the day that I experienced one of my most painful misses. You can read more about that experience in my article Missing the Shot. This shot was captured shortly after The Painful Miss, and it’s one my favourites from New York. A little good fortune came my way after all; catching the boy in such a balletic pose with no one else interrupting the frame. Photographed using the FujiFilm X-T2 and the XF16 F1.4 WR. I’ve always been captivated by science and science fiction so a visit to Florida’s space coast was a real highlight for me. I knew exactly what I wanted when I saw the Apollo 14 Command Module, although getting it wasn’t easy. But that’s the buzz of street photography. What I love about this image is the feel of an era. The film grain, the soft focus of the background, and the tones of grey evoke 1960s space exploration. Juxtaposed against that crisp (candid) silhouette. The artificial lights hanging above like a distant constellation are perhaps my favourite detail. I noticed shadows rising up the side of this building every now and then, looming out of the surrounding darkness. It immediately captured my attention. But I wasn’t happy with just a vague profile of a person passing. Another case of patience and perseverance in street photography: These boys eventually appeared, chatting away and gesticulating at something behind them just as they passed the light source. It’s a shot that really benefited from a wider angle lens, making room for those enormous shadows. Photographed using the FujiFilm X-T2 and the XF35 F2 WR. Although I’m primarily a black and white photographer, I couldn’t travel across South America without capturing some of that incredible colour. I love the way the silhouettes become part of the scene here, foreground merging with background. The construction is slightly unconventional—both subjects are at extremes of the frame—but the diagonal shadow leads the eye. This image is all about scale. Wide angles are an important aspect, but so is composition. The frame within the frame here clearly defines the subjects, who would otherwise be lost within a complex scene. 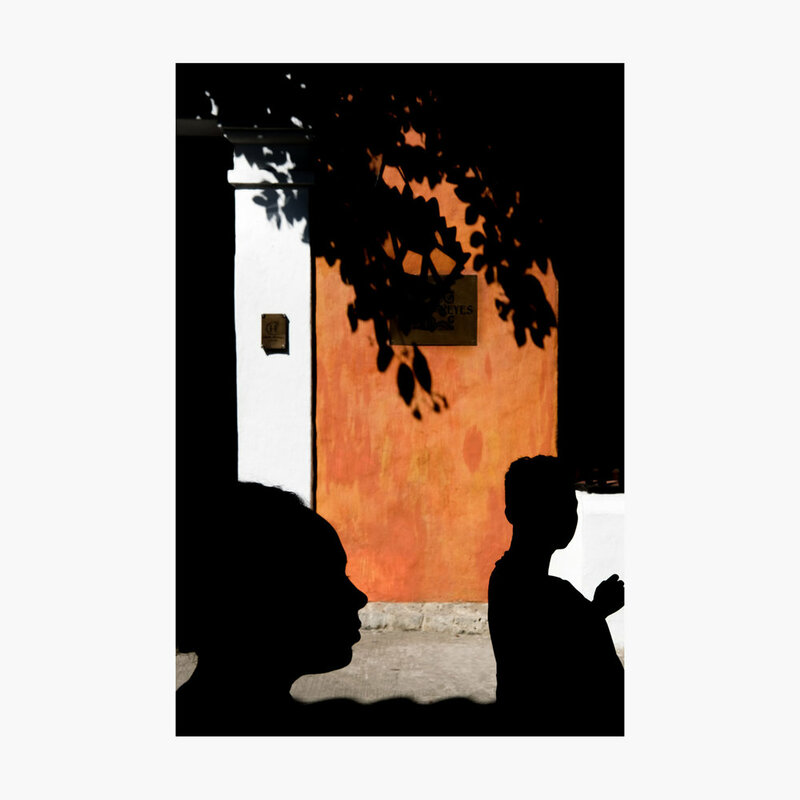 This is the sort of thing that I’ve come to spot almost subconsciously on the streets now, with light and shadow catching my eye, and framing the moment from there. You don’t come across a scene like this very often. And although I shot a number of photographs in black and white, the lure of colour was just too strong. The palette was captured with the soft tones and enhanced contrast of Classic Chrome. I positioned the sun directly behind the subject to reduce glare, creating a natural vignette, and of course, that silhouette. The last in my selection was captured after a very long day hiking the Quilotoa Loop. In the pouring rain. All I really wanted was a hot shower, a plate of food, and some much needed sleep. 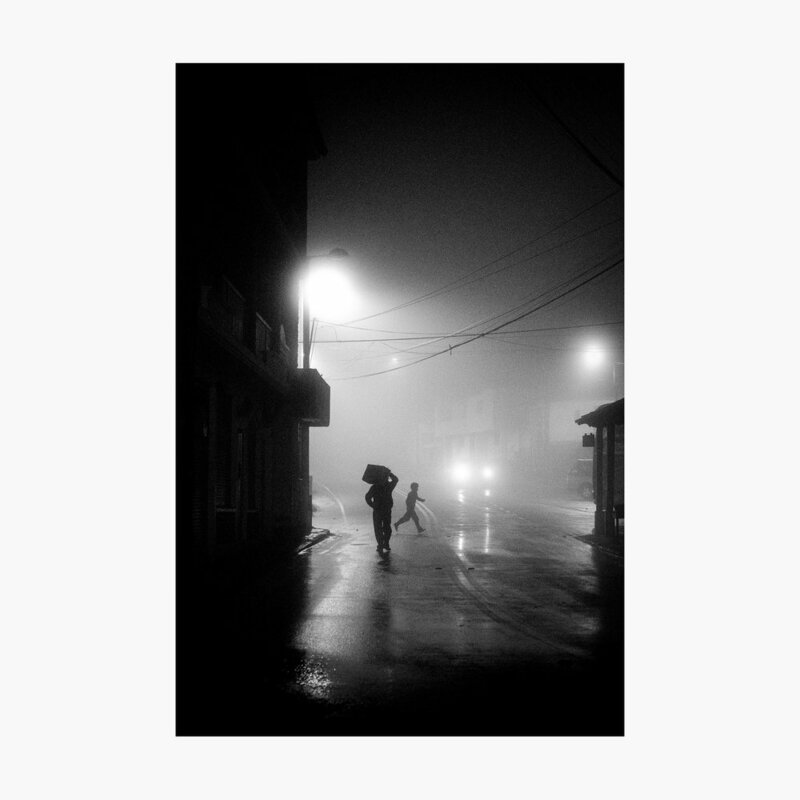 But the fog shrouding the town of Chugchilán was too enticing. Although ominous in tone, the child in full sprint with both feet off the ground brings a wonderful touch of joy to this photograph. There's also a third figure to be found in the scene, lurking in the shadows. Head over to @FujiFilmNordic to see my Instagram takeover in full from their profile page. Thank you to FujiFilm and Charlene Winfred for this fantastic opportunity and their continued support. Header image: Detail from a street scene in the village of Chugchilán, Ecuador, South America. January 2018.